When it comes to the cam tower, everyone tries something a little different and mine was so stained and ugly, I HAD to do something. This is how we did it in the sixties - paint the raised letters (as well as the background space), then sand down through the paint, exposing the letters. This little detail took about an hour to do. This high temp paint is thin and dries instantly. The paint is Dupli-Color High Heat 1200 "Aluminum" and "Black." Here I am about ready to install the the power steering pulley (not shown). When the engine was running I noticed that the pulley (a small v-belt pulley not shown above) had a definite wobble and I wanted to replace it. After I scrounged up a used pulley and was installing it I realized that the original pulley wasn't bent so much as it wasn't seated correctly. This resulted in the pulley not being centered and a hence the wobble. I could have saved the $20 if I had paid better attention and BTW, this wobble problem is one of the most commonly made mistakes (more on that later). You might notice that a mounted flywheel won't fit on my engine stand. That meant that I couldn't be sure that I had the crank at TDC and wouldn't dare guess at the correct setting for the timing belt. 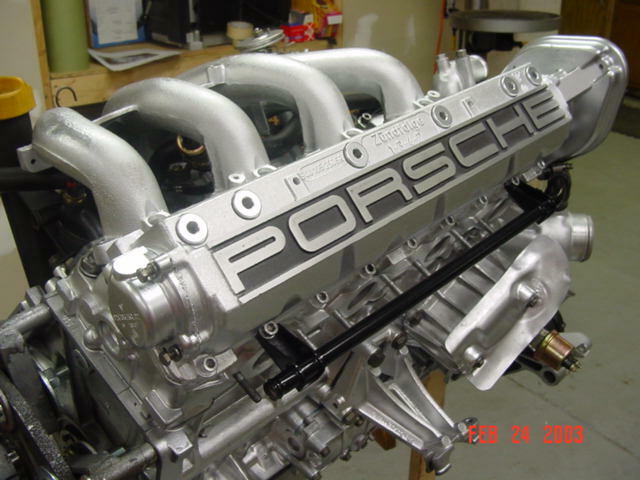 Boy, It would have been nice if the Porsche boys would have but a crank position indicator on the front of the engine (like just about every other engine ever made). I made a guestimate, by watching no. 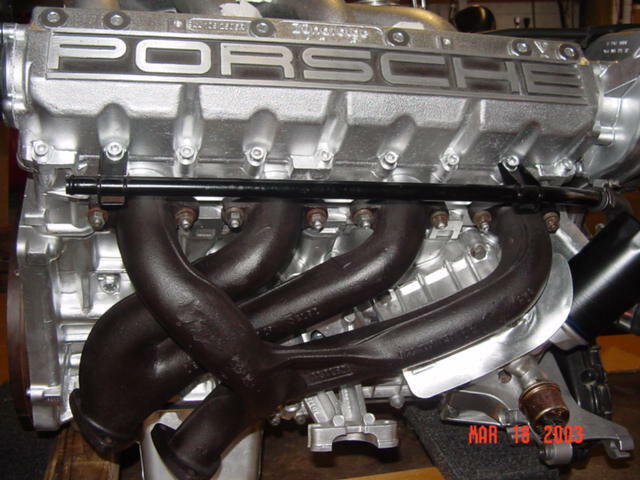 1 piston position. I casually set up the timing belt and then spent Sunday afternoon, putting the engine back on the hoist, and setting the flywheel on and finding TDC. I expected to be off a little but I found that I was right on the money. Things are going almost too well. 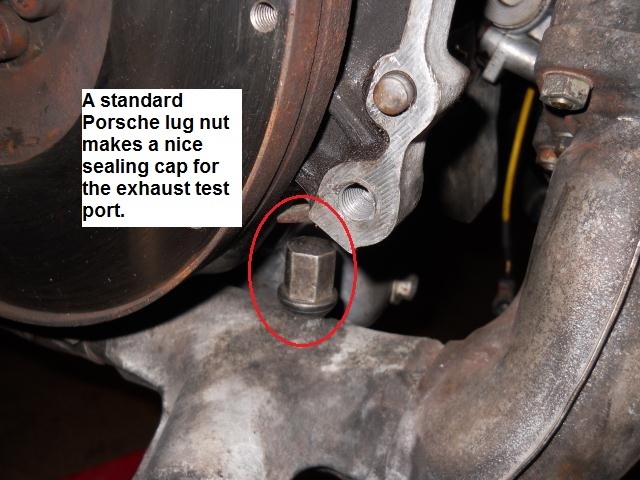 A quick check of the water pump to thermostat seal. It looks fine. 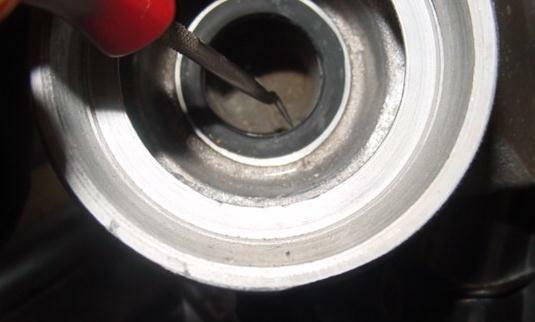 This seal can be very hard to remove - especially when the engine & pump is installed in the car. This is the seal that the thermostat's plunger presses against. There is another rubber seal that goes on the outer perimeter of the thermostat. There are two version of that thermostat seal, one much thicker than the other - the thicker one is hard to get in place. With the engine out, many small things can be done easily, like changing the rear cam tower gasket. A leak here can actually be pretty serious and has even been found to cause an oil fire. 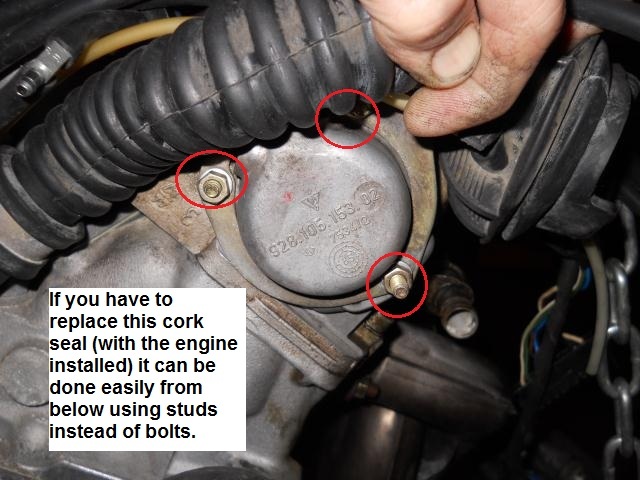 If you're changing this gasket with the engine installed in the car, then you may find it easier to do it from below using studs instead of the small M6 bolts. The studs allow you to do this with one outstretched hand and "hang" the gasket and cap. 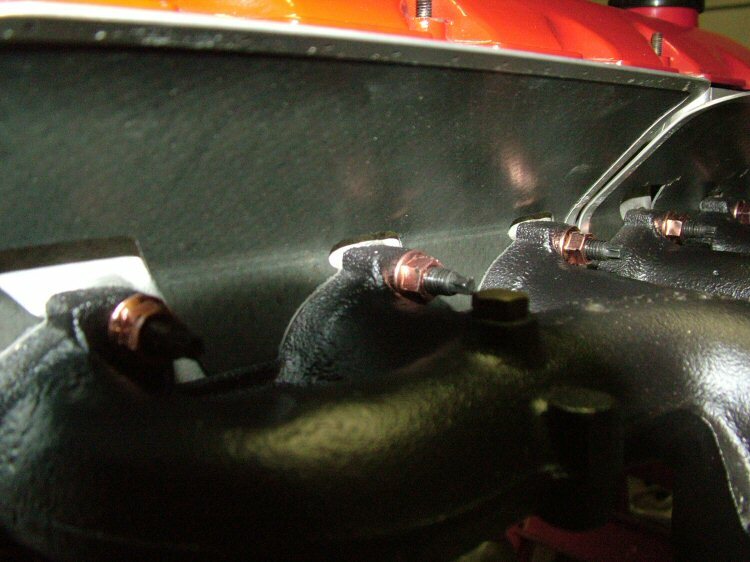 OK, I welded up the leaks in my original headers, this has been tried by many before me but most won't hold for long. So instead, I fell back to these cast iron manifolds. I think they will flow pretty well and are very strong; a little on the heavy side though. Still, I think this might turn out to be a good decision. One of the regular aggravations is with the exhaust manifold studs. They are known to break or come loose from the head. 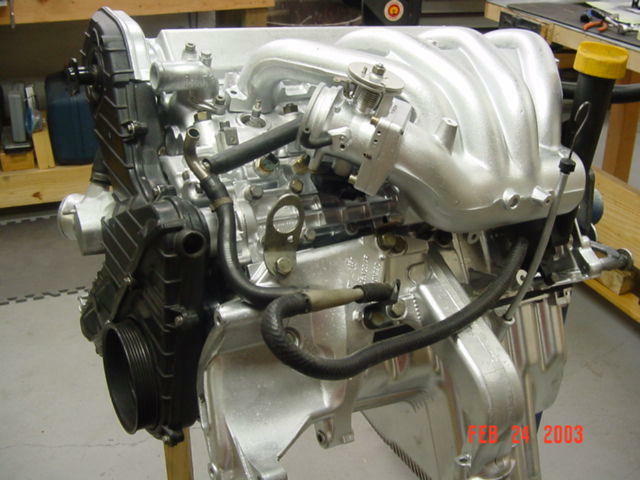 A favorite substitute are the studs from a 94 Saturn SC2, here is a pic. Find them at Napa under part number 11518152. I also replaced the rubber exhaust hangers as well as other missing hardware so that the exhaust system is well supported. The catalytic converter is quite large and positioned very close to a heat shield. I may have to come back to this area for some adjustments. 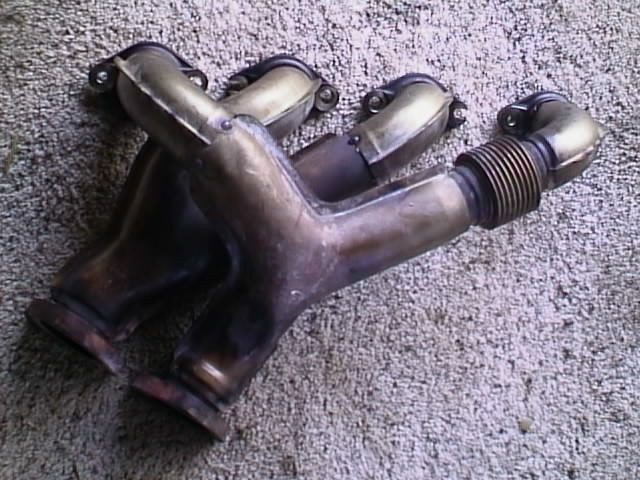 For comparison, here is pic of the re-designed exhaust manifold, that came out in 86.